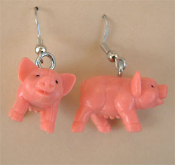 Funky Mini PIGGY PIG EARRINGS - Funny Mini BABE Porky Farm Animal Charm DIET Costume Jewelry - Cute miniature rubbery Pink Plastic toy charm PORKER, each approx. 1-inch (2.5cm) long. Great for farmers, bacon lovers, BBQ cookout picnic party or backyard Pig Roast!